Then continuing east for a Thursday night gig at one of our favorite old school haunts- St Lawrence Club in Steelton, PA on September 17. A wedding in New Jersey on Friday and then our (G.A. 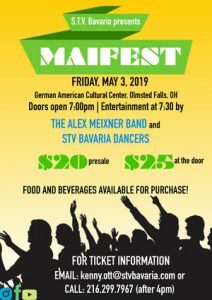 sold out, VIP available) Oktoberfest show at the Summer Stage of Central Park with our good friends, Spitze on Saturday right before the most rocking German fest on Long Island – Ompah Fest on Sunday, September 20 at Plattduetsche Park Restaurant & Biergarten. Bring your friends– they’re gonna be good ones… Michael Morris is back on drums for this leg of the tour and Fort has even flown up from Texas to rock NYC and Long Island with us! Looking forward to the shows! In the meantime, we headed west out of Ohio– drove through a lot of rain in the ol’ polka van and arrived late at night in Choctaw, OK. 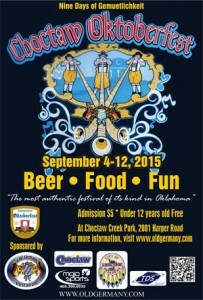 Looking forward to the Choctaw Oktoberfest starting for us today and going through Saturday. This is the first time I’m ever playing in Oklahoma, so I hope we get a good reception here. There’s supposed to be a few Texas people showing up as well– so hopefully they’re priming the crowd for us! Finally on Sunday- we’ll be in Sugar Creek, MO. The boys and I always enjoy Sugar Creek Slavic Festival- so the organizers are putting on a little Slavtoberfest as we’re passing through heading back to the east coast. There are still a few tickets available, so get them now so we have a full house to entertain! Of course we’ll be ready to play some kolos, in addition to some German Oktoberfest music and who knows what else could show up?!? Then… comes the Northeast…. PA, NJ, NY…..Central Park and Oompah Fest! Meixner plays bass like James Jamerson and trumpet like Louie Armstrong — are exceeded only by his sheer energy, showmanship, wit and hair-shaking fun.